Once again, Blitzen has overdone it with the reindeer games. He had a bit too much to drink at Santa’s holiday party and has passed out, wine glass and bottle still in hand. Dancer will twirl her way to being the life of the party with her green wreath skirt and fancy dancing shoes. Cupid will steal your heart with his bow & arrow and glittery wings. Be careful though, he’s had a bit to drink and his aim may be a little off. It was one the most talked about Christmas gifts. So cute. Definitely a conversation piece. It was a Christmas gift for a niece. She loved them! I already had 2 of your reindeer and these just make it more fun. I had to give away one because on of my friends said I had too many Blitzens. Can't wait until some of the other reindeer show up; hopefully, next year. Just be careful and make sure the cork fits the bottle so they don't fall off. Already have a couple of broken legs and glasses to glue back on. These are great holiday gifts. Nicely done, of very good quality. Stoppers are only cork, but they make great decorations, even in empty bottles. Really cute! Bought as a gift. Wish I could still find the 2017 set with Vixen in it! Great gift idea! Adorable! Antlers appear a little fragile but overall well made.I bought two sets to give as gifts with a wine opener. Fun addition to holiday entertaining, whether for a crowd or just myself. I loved this item. Gave them as gifts. Would recommend item to friends and family. I would like to receive the catalog. These bottle stoppers are adorable - all my guests loved them! So adorable. Meant to use them as place card holders at the Christmas dinner table, but they found a home on a small tree and seem to be very happy. My favorite? The Stuart Little bottlebrush mouse riding on a leaf! Brought back childhood storybook memories that will be shared with my older grandchildren. Joy and Peace to all! These are adorable!! Obviously for decoration only. These were a hit at Christmas this year for my wine loving friends! Made everyone smile!! I gave these cute wine stoppers to my wine drinking friends. They were a great hit! These stoppers are hilarious! I love them -- color & detail are great. Bought a set last year with different characters, glad to see new reindeer added this year. Hope WE will create some new ones for next year. (Prancer maybe??) Very satisfied with the stoppers and looking forward to more. I LOVE them. I bought some last year as gifts and couldn't wait to find them again. They just make you smile. I would definitely recommend them and have. The penguin bottle stopper is going to be my next order along with another set of the Blitzen & friends. They came carefully packaged. All were intact. They are adorable and make a fun gift. I would recommend purchasing from Wine Enthusiast again. Great fun gift for the wine lover! Saw them last year but they were sold out. Marked my calendar to buy them in October and scored. My brother is a true wine enthusiast and will love them! 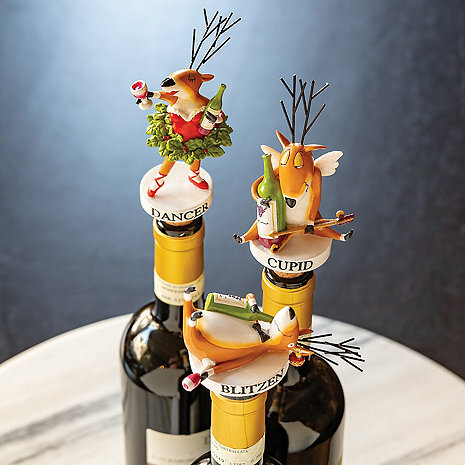 These cute whimsical Wine stoppers are so adorable. With my ladies group, they were the talk of the entire gathering. Made the ladies giggle every time they needed another glass of wine! Bought these to give as Christmas gifts and they are awesome! My family members are going to love them. A great gift idea.we have given to friends with a bottle of wine...makes a value added gift. Love them! Got 2 sets; one for myself and one for my daughter in law for Christmas! They are displayed in my "wine" area, and I got her the wine bottle shelf as well to display these fun items! Adorable. I gave as a gift and the recipient loved it/them. I love them! They make the perfect holiday gift! Very good quality! Purchased the three piece set last year and ordered this year's edition for gifts. A real hit with the true wine enthusiasts. These are so cute. I gave several away as gifts. Of course I kept one for myself. Purchased these adorable and cheeky Christmas wine stoppers as a gift, and although they were expensive, my friend was thrilled to receive them!